Organizational Structure is all about designed tasks, lines of authority, duties and supervision in achieving organizational objectives. 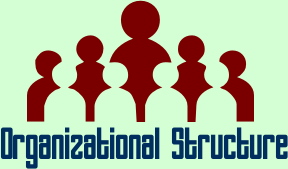 Organizational structure is formed by how the organization is designed around these activities and lines of authority so there can be various types of organizational structures according to their needs. There are six major elements of organizational structure or design. It means that your labour is specialized in one task and they do that repeatedly and becomes expert of it. So organizations have to decide what type of work force is required to perform the tasks. Work specialization improves the efficiency and eventually employee productivity. But there is also dark side of being work specialized, it creates monotonous and employees get bored of repeating the same task gain and again. In contemporary environment and organizational structure, managers keeping assigning variety of tasks to employees and keep shifting their jobs to overcome the problems. Similar sort of activities are group and performed under particular departments. Now it is to be decided that what types of activities organization is involved in, and according to that departments are created. There are various factors on the basis of which organizations may create their departments in their organizational structure. They may create Functional departments like marketing, finance, HR, IT etc. One more type of departmentalization can be based on types of customers, like end consumers, business customers. Further Geography based departmentalization includes creating departments according to different geographic regions the business is operated. Then there is also product departmentalization based on various product lines. Process departmentalization is based on different processes of business for instance in textile sector ginning, weaving, dying, printing etc. Chain of command describes the line of authority in the organization and answers the question that who reports to whom? This element of organizational structure define lines of authority and represents that how much authority is delegated down the line. Upper management empowers employees so they can take decisions. It helps employees identifying that whom they are answerable and from where orders would come. Span of control defines that how many employees are working under one manager. It also identifies the levels of management in organizational structure. Based on the number of employees under one managers, span of control can be termed as narrow or wider. In narrow span of control manager has less number of employees to supervise. It brings closer supervision but increases the cost since company has to hire number of managers with high salaries. Whereas in wider span of control, there are large number of employees under one manager, in this case efficiency is improved and cost is reduced. Wider span of control is best suitable im situation when managers are experienced and skilled, workers are skilled too and organization is not geographically dispersed. These elements of organizational design decides on how much decision making authority is to be delegated down the line into the hierarchy. Centralization refers to that decision making is done at the higher levels of organization. In such organizational structure, top management considers it wiser to be decision maker rather authorizing employees to do this. Decentralization is opposite of it as it allows giving authority to the employees to make decisions in different scenarios. This helps workers be more efficient and respond to queries and problems immediately. Formalization refers to the extent of rules and regulations being implemented in an organization. Nowadays organizational structures tend to be less formalized with less rules and regulations and more flexible towards employee's timings, policies of working hours, dress codes, attendances and holidays.